This MJ Soffe unisex short comes in a variety of colors and is perfect for jazz, tap, or hip-hop class! 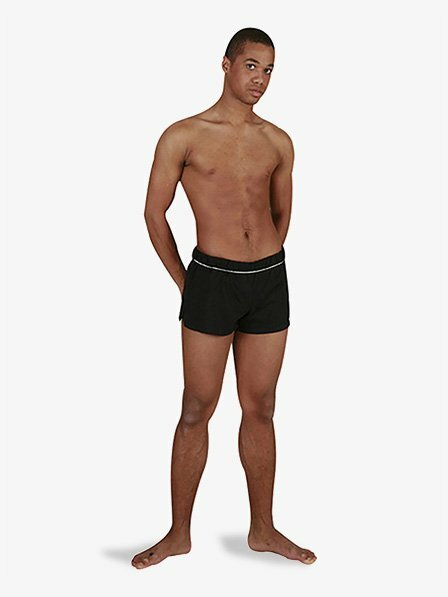 Short features a 1-1/4" elastic waistband and 2" slit on the outside bottom of the short. Machine wash in warm water, remove promptly. Do not bleach. Tumble dry. Bust 33"-34" 35"-36" 37"-38.5" 41" 44"-46"
Waist 26"-27" 28"-29" 30"-31.5" 33" 36"-38"
Hips 35.5"-36.5" 37.5"-38.5" 39"-41" 43.5" 46"-48"
These are very good casual wear and cover-up shorts which are true to size. These are very comfortable and have become my new favorite go-to shorts. Going to purchase more of these very soon. Thought they were dance material, but they were made of cotton. We like them though. I bought these believing they would look like the short and white-lined waistband shorts. I was slightly disappointed to find they were longer and not as short or tight as the picture displays. they're good shorts to dance in, but I bought them under a misconception. Your basic shorts. Comfy. Not too baggy or tight. I wear a 12/14 misses and got a medium. These shorts have a thick, uncomfortable waistband that slides up when I move. They are also baggy and unattractive. They are no different than any cheap shorts I could have bought at Wal-Mart. I sent them back for a refund. If you want these to sit on your hips go up one size. I ordered a Small (waist size 28-30" according to the website) and I think I should have ordered a Medium instead. I bought these in black and navy. Very comfy and versatile. I can wear them in ballet or hip hop or my sports outside of dance. Love them. Anyway... these are great as long as you get the right size. I bought one red and one black pair. They were both the same size (supposedly) but the red one was way bigger and it doesn't fit right. Overall: these are nice shorts. I wear them in my ballet and lyrical classes all the time. (You do have to roll the waist down or else it comes up to or above your belly button). I absolutely love Soffes because they are so versatile! I love all of the colors and use them for dance classes, as well as everyday wear! The shorts stretch, and are so comfy! Buy every color! I really love Soffes! (but who doesn't?) I agree, they work for a lot of things: I can wear them around the studio between classes and at the barre, and also they work for PJs and PE. I want these in every color =] Not to mention, $6.90 is a great price for this quality brand. These shorts are great! These are the cheapest I have seen these Soffes, so naturally, you are saving money on an AWESOME pair of shorts. They're great. Buy them Now. I mean, what have you got to lose? I love my Soffes! They are so versatile- I wear them for PE, to school, at barre, as a pool cover up, pajamas! I also love the many color choices there are. They are short so you can show off your awesome dancer legs!